1000 years of the Olympic Games: treasures of ancient Greece. Digital reconstruction at the home of the gods. AS A CONTRIBUTION TO THE CELEBRATION OF THE SYDNEY 2000 OLYMPIC AND PARALYMPIC GAMES. DEVELOPED BY THE POWERHOUSE MUSEUM IN CONJUNCTION WITH THE UNIVERSITY OF MELBOURNE. The website included presentation of the digital Olympia model; the Zeus in 3D; statuary from the Temple of Zeus; panoramas of the archaeological site at Olympia; together with a host of other interpretive information and scholarly resources. The discussion of the website is prefaced by an outline of questions raised with regard to the presentation of complex archaeological datasets in digital environments, theoretical concerns related to 'virtual reality' and digital reconstructions, and the archaeological basis for reconstruction of Olympia. I.3.7 [COMPUTER GRAPHICS]: Three-dimensional Graphics and Realism -- virtual reality; I.3.3 [COMPUTER GRAPHICS]: Picture/Image Generation -- digitising and scanning; J.5 [ARTS AND HUMANITIES] -- architecture; K.3.1 [COMPUTER MILIEUX]: Computer Uses in Education -- distance learning. 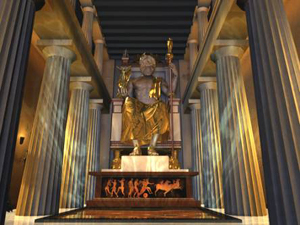 Virtual reconstruction; ancient Olympia; Zeus; anaglyph; digital; three dimensions; 3D; web; laser scan; polarised; heritage; zoomable; panoramic photography; digital cultural heritage. The works under discussion result from a recently completed project that complimented an exhibition, 1000 Years of the Olympic Games: treasures of ancient Greece, at the Powerhouse Museum, Sydney (July 18 - November 18, 2000). The Exhibition offered an opportunity to supplement the traditional visitor experience with the introduction of ‘virtual reality’ components. 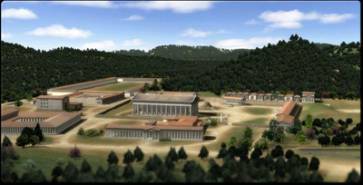 These digital works involved: a 3D digital reconstruction of the site of Olympia, in 200 BC; the laser scan of the famous statue of Zeus from the archaeological museum in Athens; and the construction of a large scale website  which delivers the Exhibition components together with a host of other information sources and interpretive material. It is through the website that we enter the ancient sanctuary of gods of Olympia, witness Zeus the wielder of the thunderbolts, and walk the archaeological site of Olympia as it appears today. This paper begins by introducing some of the visions, opportunities and cautionary perspectives that are companion to the processes of archaeological reconstruction using digital tools. Observant to the potential and difficulties of digital reconstruction, the author will then discuss some of the curatorial, and technical aspects of creating the information complex - the model of Olympia in 3D; the 3D Zeus; and the presentation of materials on the website. This paper then focuses more specifically on the website. Perspectives on the creation of the digital works that have particular relevance to the WWW10 forum include the use of "zoomable" technology to display the extensive photographic resource of object movies and 360° full screen panoramas; and the use of anaglyph glasses for 3D presentation. The website section includes a brief description of the website content together with the technical, architectural and curatorial decisions that were used to define the design. The section concludes with a statistical analysis of the website usage since its launch. Reviews of the website by industry and, education and research awards, that the works have to date (January 2001) close the discussions. Figure 1. South-southeast aerial view of the reconstruction. © Powerhouse Museum. ... interactive-computational simulation becomes the methodical ideal of the scientist: reason and observation permit the break down of an event into its primary elements and from these it is reconstructed. A tight link is established between computational information and the 'architecture of thought', because both embody man’s desire to be the 'architect' of the world. A portion of the real is no longer represented by a chain of ideas in which all pertinent information is housed, instead it is reconstructed in a way that the observer can immerse himself, react to it and be reacted to. The techniques of immersion, interaction, and sensorial interaction are all based on perceptive mechanisms (Gregory, 1998 in Forte ). They represent instruments that permit the user to operate in synthetic space, that is, to be able to understand synthetic space in all of its richness through the shifting of points of view. In archaeological enquiries the richness of the medium for teaching and theory testing in the form of alternate visualisations is potentially unlimited. To situate digital visualisations of archaeological and historical sites into museums and to translate them for the Internet represents a powerful form of interpretation. It allows for complex datasets to be drawn together forming products that are multi-sensory and easily accessible. Colonna presents his view of the flexible nature of digitally reconstructed environments (as discussed by Barceló). A virtual world should be then, a model, a set of concepts, laws, tested hypotheses and hypotheses waiting for testing. If in standard theories, concepts are expressed linguistically or mathematically, in virtual environments, theories are expressed computationally, by using images and rendering effects. Nothing should be wrong or “imaginary” in a virtual reconstruction, but should follow what we know, be dynamical, and be interactively modifiable. A virtual experience is then a way of studying a geometrical model—a scientific theory expressed with a geometric language—instead of studying empirical reality. As such it should be related with work on the empirical reality (excavation, laboratory analysis). As a result we can act virtually with inaccessible artefacts, buildings and landscapes through their models . For the Olympia project the empirical reality was based on numerous excavation reports, historical and scholastic sources (as discussed below), and in aerial and geological ground survey data. A considerable component of the project was the acquisition and analysis of source information, especially as a high degree of veracity and verisimilitude was required. The digital reconstruction process attempted at all times to create an archaeologically correct interpretation of the research materials available. 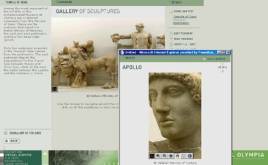 Increasingly, archaeological reconstructions are used in cinemagraphic-digital formats or 3D interactive environments. These virtual models are criticised for their ability to portray scientific speculation as ‘truth’. In general "the more advanced the level of technology used in the reconstruction and for display, the greater the belief in its authenticity" . This mechanism is also reinforced when reconstructions are displayed in the context of museums with the inherent authority these institutions confer to the works. The perspectives introduced above were to act as both visionary statements and cautionary notes to the Olympia visualisation project. Against the potential of a digitally reconstructed archaeological model the project was constrained in a number of ways with regard to the final product. Resource restrictions (time and computing power) meant that it was necessary to fix an approximate date in the history of Olympia rather than use the model to examine the changes at Olympia over time. Interactivity was also restricted to force the users to complete a tour of the site (with choices along the way) in 20 minutes, rather than allowing free interaction. Juxtaposition between the reconstruction and the archaeological site was introduced by the use of panoramas from the Olympia site as it was photographed in March 2000. The following section of the paper introduces the Exhibition as the context for the display of the works, and for the creation of the website. A team comprised of a curator, archaeologist, surveyors and photographers travelled from Australia to Greece early this year to capture the datasets in high resolution using laser scanning and digital photography. Most of the archaeological remains at Olympia are scattered across the site, the result of two earthquakes of the 6th century AD and numerous floods. Those foundations that survive date to different periods, from the Archaic, Classical, Hellenistic and Roman times. The excavations at Olympia were begun in May 1829 by French archaeologists. 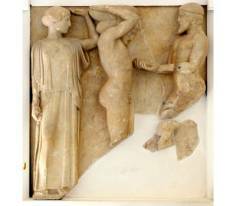 The initial finds (metopes from the opisthodomus and parts of the metopes from the pronaos of the Temple of Zeus) were transferred to the Louvre where they are still being exhibited. When the Greek government was informed of the looting of artefacts, the excavation was stopped. The project team decided to attempt to reconstruct Olympia as it had been around 200 BC. Of course, it is actually impossible to pick a single year to reconstruct an ancient site, given the relative coarseness of archaeological chronology. At a site like Olympia, used without interruption for over a thousand years, almost certainly with frequent refurbishment of quite old buildings, it is really only possible to establish the rough date a building was erected. Whether a building was undergoing renovation in a particular year cannot be stated. The length of time it took to complete buildings is also another issue. The choice of 200 BC was therefore made for mainly practical reasons: the later the date in the site’s history, the more buildings there would be, and the more interesting a virtual tour would be for modern visitors and would more closely correspond with the extant ruins; it was an Olympic year; it was just before the Roman annexation of Greece began. The project team acknowledges that the date was stretched slightly in order to incorporate the entire gymnasium and the krypte entrance to the stadium. The Adler and Curtius publications provided detailed ground plans of most buildings. As well, the elevations were usually calculated, and the extant decorative elements, mainly terracotta simae and akroteria, were associated with each building. Major additions or changes to some buildings were taken from the later publications. The drawings were used directly by the modellers to recreate each building. Figure 2. Work in progress, rendering the Pryaneion. © Powerhouse Museum. An attempt was made to incorporate as much small detail as possible given the limits of time and computing power (both in rendering and delivering the animated tour). For example, the Adler and Curtius volumes contained the differing capitals and columns of the Heraion, and these were included in the model. Inevitably, there was missing information and the limited timeframe meant that not every known detail could be incorporated. The application of colour, which is now standard in our concept of ancient Greek architecture and art, is still difficult because of the lack of evidence. One particular difficulty in using the early German work is that the colour plate published (Volume II, plate CXII) does not correspond with the text description of colours or placement, even though it is supposed to be the template for the painting of Doric buildings at Olympia. This is partly a factor of colour printing techniques in 1896 and the fact that we had the 1966 reprint, and also due to the difficulty of really knowing what colours such as “mild whitish cobalt blue” or “a strong but at the same time transparent blue” actually were. However, we followed the Adler and Curtius publications as closely as possible in terms of applying colour to the buildings, and the evidence of the terracotta roof decorations excavated at the site was particularly helpful in this regard. Buildings which must have had pedimental sculpture or for which some fragments of sculpture remain, such as the Metroon, were given pale blue pediments, rather than attempting a poor reconstruction. Doors and lattice screens were based on those depicted on black and red figure vases. Figure 3. Metope X from the Temple of Zeus. The Apples of the Hesperides. Archaeological Museum at Olympia. Photograph Powerhouse Museum. © Hellenic Ministry of Culture. Figure 4. 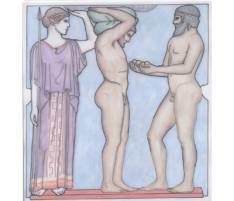 Colour interpretation Metope X from the Temple of Zeus, The Apples of the Hesperides. Drawing David Loong . Probably the least satisfactory outcome, given the time restrictions on the project, related to addition of statuary to the Altis area of Olympia. Literally hundreds of dedicatory statues and objects would have been placed into the sacred area, but only a handful could be reconstructed, modelled on excavated statue bases and the descriptions in Pausanias. The most ambitious reconstruction was the interior of the Temple of Zeus. This was based only on Pausanias’ descriptions as no evidence remains. It is thought that some coins and Christian icons reflect the seated Zeus figure, once one of the wonders of the ancient world, but they have already passed through the filter of later cultural biases. Figure 5. Reconstruction from the interior of the Temple of Zeus. © Powerhouse Museum. Choices for colour applications invite responses from the academic community. One of the most significant sculptures in the National Archaeological Museum in Athens is the statue of Zeus from Artemision (Artemesium), also considered to be perhaps a statue of Poseidon. This bronze sculpture is slightly larger than life size, and was found in 1926 in the sea off Cape Artemision. It is one of the few surviving examples of Early Classical statuary. The laser scan of the Zeus allowed this object the travel, in a virtual sense, from Athens to Sydney. Figure 7. Laser scanning the statue of Zeus at the National Archaeological Museum in Athens, March 2000. Photo University of Melbourne. © Powerhouse Museum. For technical discussions on the scanning of the Zeus and the display of the 3D model at the Powerhouse Museum (using shutter glasses)—please refer to Kenderdine  and the project website . Despite the great opportunity to produce these aforementioned interactive Exhibition materials, the sponsors of the project (Intel Corporation) and the Museums’ main interest involved the production of a state-of-the-art website. This website was intended to compliment the Exhibition, and to demonstrate the viability of the Internet to supplement and extend materials offered locally in the Museum. The ability to give access to this material to wide audiences and the fact that it will eventually outlive the Exhibition by two years is also the advantage of this medium. Figure 8. 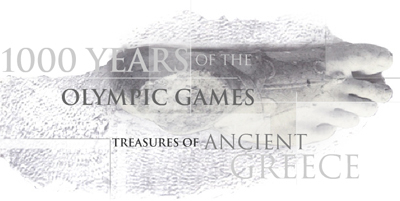 Screen grab from the homepage of the website, 1000 Years of the Olympics Games: treasures of ancient Greece, 2000. <http://www.phm.gov.au/ancient_greek_olympics>. © Powerhouse Museum. The Museum was given permission by the Greek Hellenic Ministry of Culture extensive access to the archaeological site of Olympia, and to the pedimental sculptures and metopes from the Temple of Zeus, currently housed in the Museum at Olympia. These materials, in addition to extensive archaeological and historical research, and education and programming material associated with the Exhibition itself, formed the basis for the website. In response to the sponsors’ expectations the website was constructed to demonstrate the use of state-of-the-art technologies for the delivery of rich cultural content. The website was contracted with a two-week exclusive period for the Intel Web Outfitter Service in the United States where subscribers have a minimum of a PIII chip and are regularly updated with the latest plugins. From the Museums’ perspective the opportunity to design a product with a high degree of sophistication outweighed the concerns over download times and minimum browser specifications (although these concerns were also addressed in the design). The website was ultimately intended for academic, school and researcher markets. It was also translated into Japanese, Korean and Mandarin for the Asia Pacific markets. The website was scripted as Active Server Pages. A Macromedia Flash based navigation system was used. The 360° panoramas of the Exhibition, the archaeological site and the statuary from the Temple of Zeus were constructed with Live Picture from Reality Studio. Apart from the standard plugins such as Abode Acrobat Reader the main plugin is the Zoom Viewer by MGISoft. The latter has two main utilities: it allows the high-resolution images to be stored on the server and streamed to the user on demand (thereby reducing bandwidth requirements); and it prevents the users from saving the materials to their hard drives. This last feature is of extreme importance to the Greek Hellenic Ministry of Culture and the Museum who wish to protect copyright. As noted, none of the Exhibition artefacts (also displayed on the website) had travelled outside Greece before. With a history of contentious international relations over Greek antiquities it was very important to all those involved that every measure was made to prevent unwanted use of the digital materials. Another important design decision was not to use Virtual Reality Mark-up Language (VRML) for website version of the Olympia reconstruction. In its current form VRML is not considered to be a robust or user-friendly environment for inexperienced users on the Internet (comment made in reference to the digital version of Olympia specifically). However the author notes visualisation in 3D is certainly the way forward for the display of such materials in the future, and major developments continue in this field. Limiting the number of plugins was also an important consideration. 1. The Exhibition: a series of zoomable panoramas of the Exhibition at the Powerhouse Museum (photographed in high resolution using a D1 Nikon camera and stitched together using Live Picture from Reality Studio™) augmented by 3D object movies and high-resolution zoomable images of objects, and supplemented with object information as text. Figure 9. Screen grab from the virtual Exhibition of the website, 1000 Years of the Olympics Games: treasures of Ancient Greece, 2000. <http://www.phm.gov.au/ancient_greek_olympics>. © Powerhouse Museum. The statues from the Temple of Zeus shown as a 360° panorama of the main room at the Museum of Olympia, and a series of zoomable object movies. The original photographs were taken using a D1 Nikon digital camera; object movies were made from stitching multiple successive images of each statue together. The metopes are further supplemented by reconstructed line drawings and colour interpretations using archaeological and historical records as the sources for reconstruction (also see Figures 3 & 4 above). Figure 10. Screen grab from the Temple of Zeus statues as displayed in the Museum of Olympia, 1000 Years of the Olympics Games: Treasures of Ancient Greece website, 2000. <http://www.phm.gov.au/ancient_greek_olympics>. © Powerhouse Museum. 3. 3D Zeus: a web version of the laser scan of the Zeus of Artemision (using the Zoom Viewer plugin), with the option to view as a 3D anaglyph through downloadable anaglyph glasses. The Zeus data was very dense to start with (and was finally reduced to 2 million odd polygons). This model was stitched in 3D Studio Max and an animation was produced. Live Picture was used to make the animation an 'object'. The anaglyph version was made by composting the red and blue images. All audio files are listed. 5. Image archive: due to the extensive visual components in the website this section offers a quick entry to all the individual panoramas, zoomable images, object movies and jpegs. 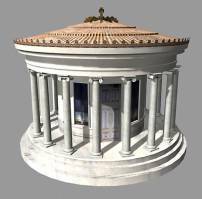 Selected buildings from the digital reconstruction of Olympia are available here, for research purposes, to download and print. Events, political, around the Mediterranean world – after 200 bc only events directly relevant to Greece or Olympia included: politics, arts & sciences. The website also contains extensive project information, help information, plugins and downloads pages. Statistical data has so far been analysed for the four-month period of the Exhibition—from the beginning of August 2000 until the end of November 2000. The author acknowledges the restricted nature of basic statistics to determine true use of the web, however general statistics are presented here to demonstrate several observable trends. The average number of hits per day over this period totalled 18,500. Other broad general-level statistics include: the average number of visitor sessions of 52, 582, and the average visitor length of 12 minutes. The majority of visitors were from outside Australia (international at 55% and unknown at 29%). A more thorough examination of the period shows a predictable variation in the data display. The most active day of use was during the Olympic Games period—on September 16, 2000 with 92,352 hits. Weekdays rather than weekends showed a larger number of hits although it was after-hours that numbers were marginally higher. This contradicts our initial expectations that the high bandwidth required to access the site would preclude extensive home use. What is potentially of more interest is the length of stay by each visitor. 45% of visitors accessed just the first two pages of the website. There was a corresponding drop off as the number of pages increased. However, a relatively high proportion (8% of the visitors) was staying over 20 minutes to access 43% of the total page views. This last statistic would suggest that those visitors who were interested in the site found rich and rewarding content. At one point in the 4 month period over 18% of the visitors were staying over 20 minutes. In web lingo this has been referred to as web “stickiness” (and hopefully not a measure of slow content download!). The website will be hosted on the Museum server for two years. As is so often the case the overall development time for the entire project was just 4 months—including the Exhibition 3D materials. This prevented extensive usability testing before launch, and represents a classic scenario in many museum projects. During the upcoming period it will be possible to further analyse the website use in schools and tertiary institutions. There have been numerous complimentary emails from such organisations about the quality of the scholastic research, although there have been requests for CD ROM version to allay the heavy bandwidth requirements. The overall project has won many awards in the short time since its launch. The most important of these include a Virtual System and Multimedia award for the Best Virtual World Heritage reconstruction; the Best of the Best website from the Australian Interactive Multimedia Industry Association (AIMIA) awards; the Best Interface Design also at AIMIA; Hitwise Top 10 for Education and Research 2000; and the website was a finalist in the British Association for Film and Television Interactive Entertainment Awards 2000. Any project of this nature is concerned with how to balance ‘realism’ with ‘reality’. The decisions made in the creation of the digital reconstruction were further constrained by the goals of the project, the intended audience, the desired product, the quality of archaeological information, and technological capabilities. In the construction of the website further caveat on design decisions included the use of state-of-the-art technologies, which must demonstrate impressive content development and display for a sophisticated web user demographic. This questioned the Museum role as a provider of ‘access for all’, but at the same time allowed for the Museum to push limits in Internet design and technology using rich cultural content. The Olympia model and content from the website are being re-purposed for CD ROM/DVD ROM which will be distributed free of charge to all schools in the State of New South Wales, Australia; and in limited numbers for other markets. 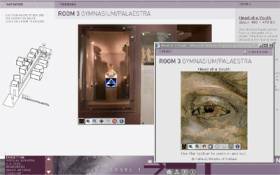 The 3D version of the digital reconstruction of Olympia is being negotiated for sale to three international Olympic museums; and it is to be used in university teaching. The versatility of use for the Olympia and Zeus models, and the rich website content demonstrate that rigorous scholarship is a worthwhile investment and can command a significant audience. The repurposing of the underlying content has enabled the works to be developed for different platforms and delivery mechanisms. The challenge lies in providing users with the ability to alter input data to test their own hypotheses. The development of VRML worlds on the Internet (that are robust in implementation) will hold much value for museum web developments. This project was made possible through the generous provision of the Hellenic Ministry of Culture, Athens <http://www.culture.gr>. A number of people in the Ministry worked hard on our behalf to make the data collection process possible. Sponsorship to complete the work was generously provided by the Intel Corporation <http://www.intel.com.au/>. MGI Software Ltd <http://www.mgisoft.com> kindly supported the license for the Zoom Server software. Thanks to co-developers Cliff Ogleby and John Ristevski from the Geomatics Department at Melbourne University for their work on the digital reconstruction of Olympia and the Zeus; to Vu Nguyen and Asher Graham of Osmosis for their excellent rendering and animation skills; to Kate Da Costa, archaeological advisor on the project was an invaluable and seriously hardworking talent, without whom we would have retired to Disney…. The website was conceived by the Powerhouse Museum. The photographic work at the archaeological site was undertaken by Peter Murphy, Sydney. It is his genius also that enabled much of the data that is displayed on the website. The overlays for the metopes were drawn by a meticulous David Loong. The sonorous tones of David Rutledge were recorded for the tour and used for a number of audio files on the website. Thanks also go to Lefki Pavlidis for her assistance with the data collection and laser scanning in Greece. To Sebastain Chan and Jessica Smith for the installation tweeks that needed to be undertaken for the virtual Olympia model. Our time in Athens was also eased by the welcome of the Australian Ambassador in Athens, Ross Burns, and consul Deborah George. We are also indebted to Jan Casson-Medhurst at the Australian Archaeological Institute at Athens. Thanks to Judith Swaddling at the British Museum for her time in reference to the scale model of Olympia housed at the Museum.